Many times I get requests for usage of my photos or even complete articles. Often, no payment is offered, as ‘the budget is low‘, ‘we are non-profit‘, ‘we will give a credit in return, which will be good for you!‘ and other, similar motivations. 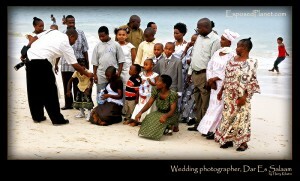 Photography is a profession, we need to make a living and websites and cameras cannot be bought with ‘credits’. Photographers are often helping out people who need it, but any charity or non-profit that pays thousands of dollars in salary to each member of their management team (would they agree to work for ‘credit’? 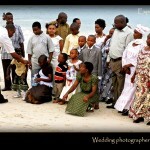 ), can also afford to pay for photography. Text by Tony Wu, under CC license (images are all rights reserved and cannot be copied). 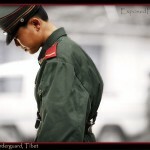 See original and undersigned photographers here. 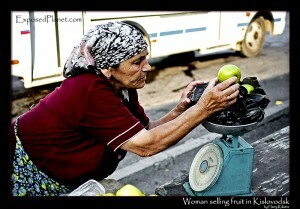 Russian woman selling fruit on the street. Would she accept a 'credit'? 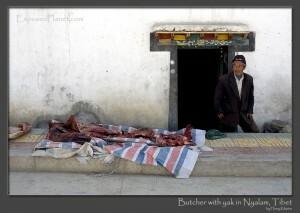 Tibetan butcher selling yak meat. Most of us do contribute photographs, sometimes more, to support certain causes. In many cases, we may have participated directly in projects that we support with images, or we may have a pre-existing personal relationship with key people involved with the efforts concerned. In other words, each of us can and does provide images without compensation on a selective basis. Hellomoney! Begging kids in Tibet. Such requests frequently originate from organisations with a lot of cash on hand, whether they be publicly listed companies, government or quasi-government agencies, or even NGOs. Often, it is a simple matter of taking a look at a public filing or other similar disclosure document to see that the entity concerned has access to significant funding, certainly more than enough to pay photographers a reasonable fee should they choose to do so. 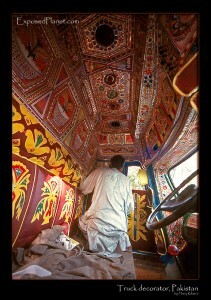 Artist in Pakistan finishing the interior of a truck. He also has no time for unpaid work. Our profession is by nature equipment-intensive. We need to buy cameras, lenses, computers, software, storage devices, and more on a regular basis. Things break and need to be repaired. We need back-ups of all our data, as one ill-placed cup of coffee could literally erase years of work. For all of us, investment in essential hardware and software entails thousands of dollars a year, as we need to stay current with new technology and best practices. Girl selling goods in train, India. Some people need to invest in travel to make some money. And of course, perhaps most importantly, there is a substantial sum associated with the time and experience we have invested to become proficient at what we do, as well as the personal risks we often take. Taking snapshots may only involve pressing the camera shutter release, but creating images requires skill, experience and judgement. 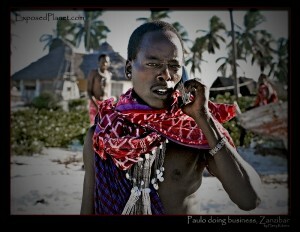 Paulo calling from his beach office in Zanzibar. He's not making his art for just a credit, either. 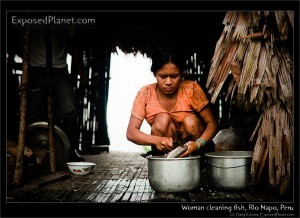 Woman cleaning fish, Rio Napo, Peru. In instances where we do agree to work for free, please have the courtesy to follow-up and let us know how things went. A little consideration will go a long way in making us feel more inclined to take time to provide additional images in the future. (text only, images are all rights reserved). Note to photographers: You can use the above text (not the images) under a Creative Commons Attribution-NonCommercial-ShareAlike 3.0 Unported License. Please ensure that you include a link to this page and the original page. Text by Tony Wu. The photos above are to illustrate that there are hard-working and underpaid people all over the world, that everybody is trying to get by in their own way. Of course the situation of even the poorest western photographer is incomparable to that of any of the people above, as they normally have no choice whether to work for free or to do what they want. 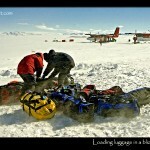 Click the photos to read & learn more about their lives, work & home on the ExposedPlanet photoblog. 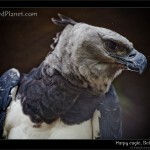 This entry was posted on Saturday, October 15th, 2011 at 12:13 pm and is filed under Guest Bloggers, Photography Business. You can follow any responses to this entry through the RSS 2.0 feed. Both comments and pings are currently closed. Great piece Harry. The images really bring home the point. I had a request just today from a woman that wanted to copy my image from G+ to facebook to share with a sick child. I felt bad in saying no but you have to give it away or make a stand. As mentioned in the article: we do try to help many times but there is a limit. Somehow the taxi driver, cable company, pharmacy and other people involved in the child’s illness are never asked to provide their work for free.